AOL has released a new beta version of AOL Instant Messenger program. In this release (AIM 6.9.7.4 Beta 3), you'll get everything from AIM 6.9 Betas 1 and 2, plus a new gold design, status and away messages in your IM history, access to AIM Blast, text emoticons and much more. · Sleek new design: New buttons, new layout, new color, new brand! Tell us what you think of our shiny gold look and the new layout. · Profiles, profiles, profiles: Connect with your buddies like never before. Customize your profile, get updates from other social networks, and more. 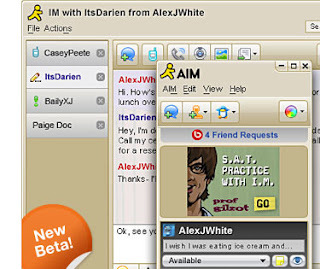 Now, you'll never miss an update on AIM. · If you had an AIM Profile, we're migrating Profiles over to Bebo; if you never set one up, it's easy. Just select Edit > My Profile to get started. · Never miss a friend request! Get notified of new Bebo friend requests at the top of your Buddy List®. · Get pop up notifications when Bebo friends add comments and photos. Be sure to test the preference under notifications to manage their display. · Seamlessly add a buddy to Bebo when you add them to AIM. · Select Add Buddy from the Buddy List Set Up icon at the top of your Buddy List.